Valentine’s Day greetings come in many shapes and sizes. 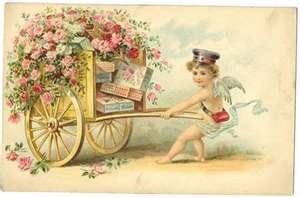 On February 14, people in the United States, Canada, Mexico, the United Kingdom, France and Australia can be found expressing their affection by sending cards, flowers, chocolates, and other special treats. These Valentine’s Day traditions are rarely disputed but the story of how the holiday came to be has many interpretations. Before his sainthood, Valentine was a priest who protected young lovers’ right to marry in third century Rome. It is said that Emperor Claudias II banned marriage around this time because he believed that “single men made better soldiers than those with wives and children” (History.com). During this authoritarian ruling, Valentine defied the law and continued to marry couples in secret. He was later killed because of these actions. Considered a martyr, the Catholic Church recognized Valentine as a saint and, in 5th century AD, Pope Gelasius declared February 14 as a holiday to celebrate him. There is some debate about why February 14 was declared Valentine’s Day. One thought is that this date was an anniversary of St. Valentine’s execution by Claudias. It is also believed that Pope Gelasius wanted to implement a religious celebration that could negate a long held pagan festival called Lupercalia, which was held annually on February 15. The holiday hasn’t always been known as a romantic affair. According to public record, it took nearly 1000 years for the first Valentine’s Day card to be written. However, by the 18th century it was common place for people to exchange written notes and presents in the name of love. With the advent of the printing press, cards were created in mass quantities, which encouraged people to send “ready-made” cards. Valentine’s Day has grown into a widely celebrated and beloved holiday in many countries, and knowing the history behind February 14 adds richness to the date. Celebrate Valentine’s Day by partaking in something you enjoy and sharing it with others. Express your love through art by creating a beautiful picture. Not an artist? Become an artist in minutes by using Segmation, the only virtual paint by numbers game. Choose a pattern today: http://www.segmation.com/products_pc_patternset_contents.asp?set=VAL. Happy Valentine’s Day from Segmation. The history of Saint Valentine I did not know. Wonderful. History lesson into product. Perfect. I see someone’s been doing their reading lately. Also, I love the way the software has flexibility where ideas are able to be painted! Are there finished products we can see? …who can see so much more with your product. I include myself with those who did not know this history of St. Valentine! Great post!